December 9: A double shadow transit of Jupiter’s moons will occur. It will take place from 4:18 to 4:27. It’ll be best seen in Eastern North America. Don’t miss it! December 12: Another double shadow transit of Jupiter’s moons will occur from 16:19 to 16:44. It favours North-Western North America. December 13: Geminid Meteor Shower will peak at approximately 1:00. Unfortunately, a waning gibbous moon will obstruct our view. December 18: Asteroid 702 Alauda will occult a star that shines at +6.2 magnitude. It will be best seen at eastern Australia at 14:12. December 21: The Winter Solstice occurs at 23:03. The Northern hemisphere will experience the shortest day of the year, and the Southern hemisphere will experience the longest day of the year. December 21: The International Space Station will experience a period of full illumination with many views of the ISS, best seen at the southern hemisphere. December 21: ANOTHER double shadow transit of Jupiter’s moons will occur. It will take place from 14:17 to 15:55. It will be best seen in Asia and Australia. November 1: Mercury reaches its greatest elongation at 18.7 degrees West of the Sun. It will have a brightness at magnitude -0.5. This is the best time to see Mercury in 2014, for observers in the Northern Hemisphere. November 18: Leonoid meteor shower will peak at this time. It is best seen in the Altantic region. The moon will be in a waning crescent phase, which means the Moon’s light will not obstruct the meteor shower. November 20: Asteroid 3 Juno will occult a +7.4 magnitude star. It is best seen in North-eastern US and Eastern Canada. November 27: Moon will have its farthest perigee of 2014 at 369,824 km at 23:12. October 4: 1 Ceres passes 30′ north of Saturn. October 6: Draconid Meteor shower, which is hard to predict due to a high variability of rates and timing, is not likely to be seen due to a Full moon. October 8: A total lunar eclipse will occur at 10:56 UTC. It will be visible from the Pacific Rim. 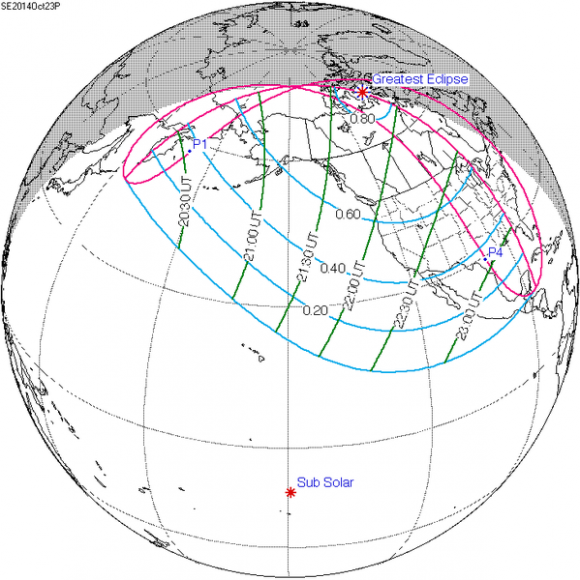 Here is an image that shows where the eclipse will be visible from. 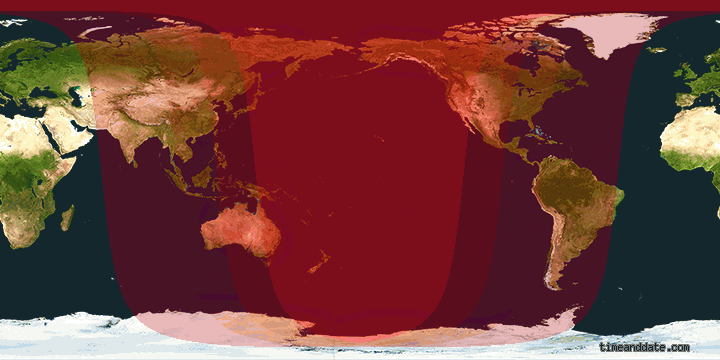 Anything east of the intense red shading, means that the Moon will set during the eclipse. Anything west of the intense red shading, means that the Moon will rise during the eclipse. Where the Eclipse will be visible from. In addition, Uranus will be a degree away from the eclipsed Moon. Check it out! October 13: The Moon reaches its shallowest northern declination at +18.5 degrees. October 14: Comet C/2012 K1 PanSTARRS may reach magnitude 5.0 for southern hemisphere observers. October 19: Comet C/2013 A1 Siding Spring passes just 7′ from the planet Mars. The Globular cluster NGC 6401 also lies nearby. The comet’s periareion (Periapsis on Mars) will be from 138,000 – 141,000 km from the surface of Mars. It will reach periareion at 18:28 UTC. To compare the distance, Mars’ outer moon, Deimos orbits at 24,000 km from the planet. It’ll be pretty far away, but on the surface of Mars, it will have a brightness of magnitude -6. That means it will appear to look as bright as Venus from Earth. Check it out! October 22: The Orionid meteor shower will peak at approximately 5:00 UTC. It will be best viewed in the Americas. It will be good, since the Moon is at a waning crescent phase. October 22: The Moon will occult Mercury in Australia 24 hrs prior to New Moon. October 23: A partial solar eclipse will take place. It will be visible in North America. It’s greatest eclipse will take place North of Nunavut, at 21:46 UTC. Make sure you get proper eye protection to see the solar eclipse. Don’t miss it!! Path and Visibility of the Eclipse. October 25: The Moon will occult Saturn for the Northern Atlantic at approximately 15:43 UTC. October 25: The Moon will reach its shallowest southern point for 2014, at a declination of -18.6 degrees. September 5: Venus passes 0.7 degrees from Regulus. September 9: The last supermoon of the year will occur that day at 1:39 UTC, 22 hours after passing its perigee. September 15: Comet C/2013 V5 Oukaimeden might reach 5.5 magnitude for observers in the southern hemisphere. September 20: Mercury will pass 0.5 degrees south of Spica at 21:00 UTC. September 21: Mercury will reach its greatest elongation, being 26.4 degrees east of the Sun. It will shine at Magnitude 0, in the dawn sky. The best view of this will be for southern hemisphere observers. September 23: GEO Satellites eclipse seasons occur. This is when the Geosynchronous Satellites will enter the Earth’s shadow and, just like a lunar eclipse, becomes darkened for a few minutes. September 28: The Moon will occult Saturn at approximately 4:25 UTC. The Moon will also occult minor planets 1 Ceres and 4 Vesta at the same day. July 4: Earth reaches Aphelion, which is when the Earth is farthest from the sun along its orbit. It will take place at 2:00 with a distance of 152,098,232 km. July 4: At 3:00, Pluto reaches opposition. July 5: 1 Ceres and 4 Vesta are 10 arcseconds apart, which means they appear to be REALLY CLOSE to each other! Check it out. It will be at the constellation Virgo. July 6: The Moon will occult Mars at ~1:21. It is best viewed in South America. July 8: The Moon will occult Saturn at ~2:25. It is best viewed in Argentina and Chile. July 12: Mercury reaches maximum elongation at 20.9 degrees west of the Sun. It will be shining at a magnitude of +0.4. July 12: The Full Proxigean Supermoon will occur in 2014 at 11:27. It reaches the Full phase 21 hrs before reaching its perigee. This is the first of three supermoons this year. July 28: The moon reaches its farthest apogee for 2014 at 3:28. The moon will be 406,568 km from Earth at that time. July 30: Asteroid 103 Hera occults a +6.1 magnitude star at approximately 1:11. It is best viewed in west Africa or central South America. July 30: The Southern Delta Aquarids Meteor shower will peak at this time. The timing is variable, but there is a waxing Moon, which means it will set early for the meteor shower. The Moon will be four days from its New phase. To all my readers, from now on, to keep these monthly updates international, I will no longer be advertising RASC Toronto Centre Events. I’m sorry if this has inconvenienced anyone. May 3: For viewers in North-West Brazil and Peru, at approximately 9:17 am, asteroid 105 Artemis will occult a +7.7 magnitude star. May 4: For viewers in Peru and Ecuador, at approximately ~10:12, asteroid 34 Circe will occult a +7.4 Magnitude star. May 6: The closest lunar apogee will occur at 10:23 with the moon being 404,318 km distant from Earth. May 5-7: The Eta Aquarid meteor shower will peak. This meteor shower started at April 19, and end on May 28, but the most meteorites you will see will be on May 5-7. This meteor shower is made up of the remains of Halley’s comet. The first quarter moon will be present at the beginning of the night, but after 12 pm, it will set and the sky will become dark enough to view the meteor shower. While, they can come from anywhere, their origin will usually be from one point, and in this case, it is from the Aquarius constellation. Comets will leave gas behind when it ejects gas. That dust is scattered about its orbit, and when the Earth intersects with the comet’s orbit, then more of the comet dust will enter the atmosphere, and form a meteor shower. Since they are orbiting the same direction, it appears to all come from one point in the sky. That is called the radiant. This dust is how meteor showers occur. May 7: For Australia and Indonesia, asteroid 206 Hersilia occults a +7.5 magnitude star at approximately 17:49. May 10: Saturn reaches opposition. It is shining with a magnitude of +0.1. It’s rings are tipped over a maximum of 23 degrees into our line of sight on February 11th, and will widen overall in 2014. May 13: A double transit event will take place on Jupiter from 9:20 – 9:32 visible from North-west North America. May 14: The moon will occult Saturn on approximately 12:18. This will be visible in Australia and New Zealand. 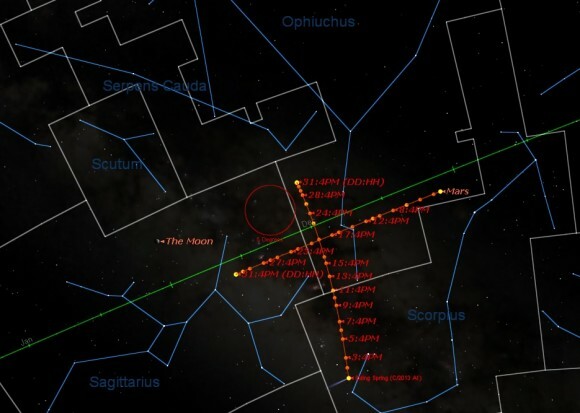 May 24: A meteor shower may occur here thanks to Comet 209P LINEAR. May 24: For South America, Asteroid 33 Polyhymnia occults a +5.5 magnitude at approximately 8:30. May 25: Mercury reaches maximum dusk elongation, 22.7 degrees east of the sun. This is Mercury’s best evening apparition for 2014 for northern hemisphere viewers. May 3-4: the AstroCATS will take place. It is a trade show that features seminars, guest lecturers, exhibitions, and many other events. There is also a special hotel accomodation for the guests. It’s going to be fun. May 5 – 8: RASC will be hosting a city star party at either Bayview Village Park or at High Park. These parties are dependent on the weather, and a window is set for the party. If a night is clear, RASC gives the GO call and the party will take place that day. If a NO GO call is given, the party is postponed until the next day when another GO/NO GO Call is given. If all the days in the window were given a NO GO call, then the party is cancelled for the month, and will try again next month. If a GO call is given, guests start setting up their telescope at around 7:30 pm. Go to rascto.ca for more information and for the GO/NO GO call. It’s free to attend for the whole public. Wednesday, May 7: Marshall L. McCall, who works at York University’s Department of Physics and Astronomy will talk about the arrangement of galaxies all around us and how that affects us. It will take place at the Ontario Science Centre. It is free to attend, and everyone can attend. May 21: It is RASC’s Recreational Astronomy Night. It will take place at the Ontario Science Centre from 7-10 pm. Parking is free after 6 pm. There will be four speakers: Francois van Heerden will discuss the sky this month. Jason Toliopoulos will discuss Astronomy for dummies… by dummies. Francois van Heerden will give an update by the RASC board of directors. Lastly, Paul Mortfield will give tips to help us bring astronomy to people at star parties. It is free to attend, and anyone can attend. May 24-25: Members have the opportunity to work at the E.C. Carr Observatory. This is the Carr Observatory Spring Work Party. It’ll allow you to get hands on experience in working at an observatory. There is room for everyone there. It is for members only, but members can attend for free. It is at Blue Mountain. Go to rascto.ca for more details. On May 26-29: RASC will be hosting a Dark Sky Party at the Sault Lake Conservation Area. At this party, it will be dark enough to view the faintest objects in the sky, such as M51, Andromeda Galaxy, and many other Deep Sky Objects (DSO’s). This event is weather dependent, therefore go to rascto.ca for the GO/NO GO call. It is free to attend, and everyone can attend. Telescopes not mandatory.